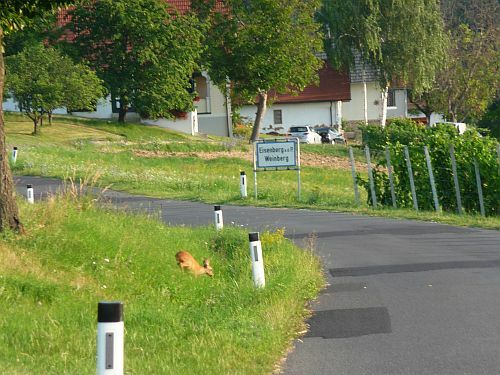 My new life in Burgenland: A Solitary Walk No Longer. A Solitary Walk No Longer. 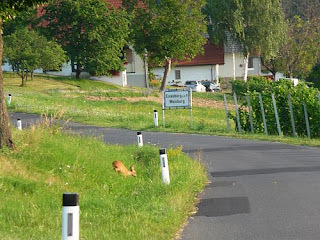 I treasure my Sunday perambulations around the pristine early morning landscapes of Eisenberg. A time when most are dozing Saturday's excesses away, a time when birds are dangling happily upon a telephone wire and a time when deer feel free to roam streets and fields. Just past Wingl, heading out to the open road and vista ahead of me, I heard the annoying click & scrape of a Nordic walker. Not a stranger but one who normally doesn't cross my path. Now he was a mere ten meters ahead of me and the only chance to change tack was a few hundred meters further. Should I walk slower, faster or take the chance that we'd walk side by side albeit on opposite sides...didn't feel like chatting my walk away. Suddenly he spotted a hunter on the side of a field. Yes, it sounds odd and was even odder when I saw him talking to a fully clad hunter with coat and riffle on the edge of a local maize field. But I was glad that I might not have to put one of my various speed options to the test. He must have been gladder still, or so I thought. I couldn't believe it ! He turned back to walk on the road mere steps from me and we were side by side for long enough for me to give a fleeting greeting whilst firing the turbo in my legs. Before you think me awfully rude, he only gave a short nod and a mumbled greeting that by no stretch of the imagination was an invitation for a conversation. 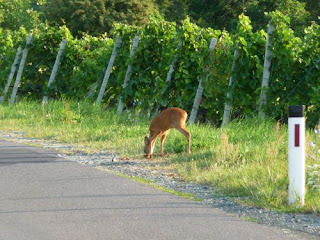 A couple of young deer were grazing along the side the road before casually crossing it mere meters ahead of me. How divine, how rewarding and how serene. I paused for a few minutes contemplating nature and its wonderful creatures. Just as well the Nordic sticks were pounding the pavement elsewhere. These two must have been young still. They let me get quite close before bolting away. Hopefully not in the hunter's direction. The Hot Long Walk To Stubits's. The Quest For A Front Door Parking Space. It's Not Every Day One Sees Mustering Of Storks. A Cat Who Thinks She's Human. Old Wisdom, Still So Relevant Today. An Early Start To The Day. Thoughts From The Past Relevant Till Today. Breakfast Run Old Boy Style. What A Cracker Of A Match. A Typical Friday Afternoon In Eisenberg. A July Day Awakens Around Eisenberg. Second Hand Clothes Are A Treasure Trove. A Bit Of Cattiness About The House. A Golden Start To The Day.